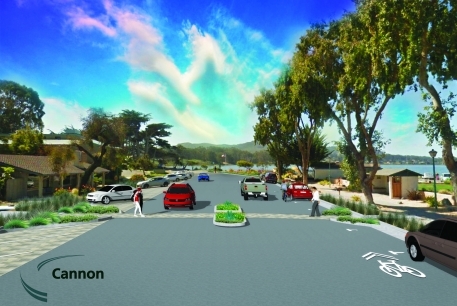 A green/complete street concept design was developed for two blocks of 2nd Street in Baywood. This area is used frequently by the public for passive and active recreation. Rather than evaluate a full street reconstruction that would be very costly, targeted improvements that leverage the existing landscaped areas and make use of the wide street right-of-way, were examined. The concept design integrates stormwater management, improves pedestrian safety, and is consistent with the community's planning effort, which is led by San Luis Obispo County. The design also includes pedestrian safety improvements that slow traffic and provide safe crossing areas. Effort was taken to create a concept design that was appropriate for this particular neighborhood, which includes significant foot traffic in the street, a weekly farmer's market, street fairs, and an informal neighborhood atmosphere.